What are precautions of jaw crusher debug and operation? NewsHome > News > What are precautions of jaw crusher debug and operation? In modern society,PE jaw crusher machine plays more and more role in stone crushing plant and artificial sand making line. Great Wall jaw crusher manufacturer produces the PE jaw crusher, JC small jaw crusher and PEC diesel jaw crusher.Jaw crusher hot sale for its competitive price and reliable crushing capacity. 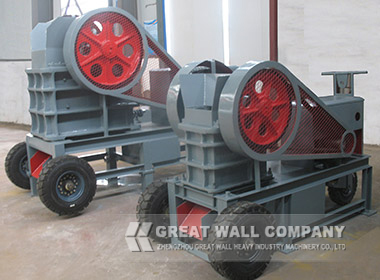 Jaw crusher has well performance for high hardness stones such as granite, basalt, bauxite and pebble. How to make full use of jaw crusher in construction industry and real estate? What are precautions in jaw crusher debug and operation? 1, PE jaw crusher should be installed in place of shelter, which should not be installed in leakage day. 2, Jaw crusher motor should be installed in the back of the crusher,direction direction must be in accordance with the requirements, it can be not reverse. 3, Jaw crusher machine should be fastened on the concrete foundation, the jaw crusher foundation should be designed with aside discharge chute, the slope is greater than 40 degree, jaw crusher user can decide the foundation according to the material and transport equipment. 4, Make sure PEC diesel jaw crusher spare parts good lubrication before jaw crusher debugging in stone crushing plant . 5, Jaw crusher loading operation need ten hours, if jaw crusher crushes hard ore with no failure, and the bearing temperature does not exceed 70 degree centigrade, and then jaw crusher can put into stone crushing plant.